Notice: Video Archives are getting too large. As of next week, I'll be moving video and state data to an Intelligence Blog. Currently converting Rod Jetton interview Friday, May 31, 2008 from American's For Prosperity Missouri Summit. Following Jetton Viceo - Mavis Musiek, Executive Director of the 7th District Congressional Republican Commitee was voted to the position of Missouri Republican Secretary. Buskiek, has been an active political figure in the US 7th Congressional District for some time and plead to Ron Paul Republicans, "Not to give up the fight". Through the credential process, Ron Paul Republicans were both acknowledged and invited to participate in the inner circle of the Republican Party. The majority of "Contested Delegates" were admitted into the convention today with the exception of a few dozen Libertarians - identified by listing in the Blue Book - a resource manual published by the State of Missouri. State Republicans rejected the FAIR Tax and ended the session early before a dozen amendments to the state platform. Robert's Rules of Order was invented by men who really wanted to wear gray wigs but realized such outfits aren't ridiculous enough. TIF District - North Park Branson Landing - "Whose Park Is it Anyway"
The Missouri Republican Convention broke for lunch. My laptop is down so I'm corresponding from Guest Services. Unlike the march of Missouri's political leaders into the convention center, this event is being covered by multiple media outlets. Ron Paul supporters relatively calm pressing technical issues and succesfully playing Robert's Rules of Order in hopes the process will change next go around. Since most contested delegates were credentialed - no riots broke out. Libertarians aren't invited as delegates to the floor. Kenny Hulshof pulled the press out of the Missouri Convention floor to announce Kit Bond's endorsement. John Combest twitters the announcement two hours early. Later today we'll be posting interviews of Missouri's Top Candidates with analysis of coverage. Since the press is here - except for local media outlets - we'll be honoring them with analysis, links and posts. Pictures we'll sell to the local rags. Rosenbaum beat me to the punch with video on Hulshof's announcement while pushing the discourse with gubernatorial candidates to MOHELA. Still, deep party philosophy, theology and debate took place far from the reaches of traditional media outlets yesterday at the summit at the Branson Convention Center - still blown away by the Rod Jetton Interview. He strongly defended his position on the Village Law as a property rights issue. Steelman played down Kit Bond's announcement citing failed endorsements of the past - (He didn't endorse Ronald Reagan) and addresses the post below disregarding the gender issue. Missouri Republicans are holding their state convention in Branson this weekend. And, as many of the delegates and officials attended a dinner Friday night at the man conference center and resort, presidential candidate Ron Paul held a rally at a theater a few miles away. The Texas Congressman fired up an estimated crowd of about 1,300 with his call for pulling U.S. troops out of Iraq, an end to what he claims is the doing away of our personal liberties, elimination of the federal income tax, getting rid of the Patriot Act, and pulling the United States out of the United Nations. The actual business of the convention takes place on Saturday, with many of the Ron Paul supporters who were chosen as delegates fearing they will not be seated because of what party officials call irregularities and what Paul supporters say is an an effort to oust them from the activities. Two groups are talking politics in Branson this weekend. One is the Republican Party faithful and the other call themselves rabble-rousers. They are supporters of presidential candidate Ron Paul. Friday night Republicans from both groups set the stage for this weekend's state party convention. Two thousand republicans are gathering in Branson this weekend for the Missouri republican convention. This is not it. This is the freedom rally. And these are the supporters of Ron Paul, the Texas congressman who's all but eliminated from the race for president. Now he's urging supporters to influence the party. Ron Paul; I think the Republican Party has lost its way and that's why we're losing and that's why we have to change. I think the Republican Party should be ecstatic about us bringing millions of people who want to be in the Republican Party. About a thousand people came to this Branson theater sized church to hear about the revolution. The Sebert's brought their three children. I think it'll make an impact later on - not now as much he'll be like I saw Ron Paul and it might impact the way he votes in the future. It's a battle of the big names in Branson this weekend on this side of town you've got the man who started a revolution... On the other side or town, a two time Governor rallying the party. 750 Republicans gathered at the chateau to hear Missouri party leaders and Oklahoma Governor Frank Keating. But they're not just here for the speeches. We're here to elect the remaining delegates that will head up to the Republican national convention in Minneapolis St Paul. There are 26 that will be elected. 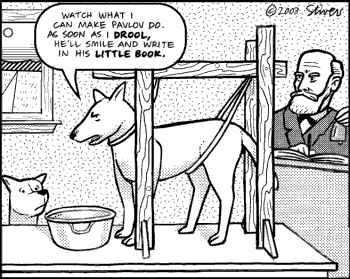 The dynamic between the two groups - if there is any will play out during that process. Saturday morning the Republican Party will be credential-ing 1600 people at Chateau on the Lake. There will be 150-seats for guests, after that no one else is admitted. (Associated Press Writer David Lieb was trying to Hack Internet Access at 11:00 PM. Sarah Steelman is challenging US Rep Kenny Hulshof for the Republican Governor candidate. Party leaders are attempting a neutral stance but the power is clearly behind Hulshof. Is running a woman a better choice? The picture above is from a Democratic gathering organized by Cathy Hilliard. The "Hillbillies for Hillary" T-shirt was commissioned work created by Cartoonist John Logan. Delegates sent to the Missouri Democratic Convention split between Obama and Clinton. Would the Republican's be better off running a woman, especially since it looks like Obams will carry the Democratic nomination? Southwest Missouri Democrats unanimously voted for Hillary Clinton in the primaries - would more of the crossover vote come from a right leaning woman as opposed to a left leaning man? American's For Prosperity sponsered an all day event at the Branson Convention Center. Missouri's top brass appeared including Missouri Governor Matt Blunt, US Congressman Roy Blunt, US Congressman Kenny Hulsof, and posted above Missouri Treasurer Sarah Steelman. Community and individual involvement in governance was tha main issue being discussed as state leaders urged citizens to get involved and to share their experience and lend their expertise to legislative leadership. Missouri Rep. District 62 discusses the emotional response he gave after the 2008 session ended earlier this month. A Libertarian leaning think tank established to limit government interference with private enterprise is currently holding a convention in Downtown Branson. Later today.....Ron Paul (follow the links below to see our interviews with Ron Paul filmed earlier this year). And of course - the Republican Convention.... It's a Political Party party. The Republicans are here but the Democrats have been here also and for good reason. The G-Rated environment is perfect for political fundraising. Missouri Governor Matt Blunt will speak just hours from now joined by Missouri Gubernatorial hopefuls Sarah Steelman and Kenny Hulsof. US District 7 Rep. Roy Blunt will also make an appearance, his third this month. It's a Republican Party today but Democratic Gubernatorial Nominee Jay Nixon pulled a cool $30,000 following a state sponsored show in Downtown Branson last month. Roy Blunt's Democratic challenger, former Federal Prosecutor, Richard Manroe appeared last weekend at the Branson Farmer's Market (which will be Downtown tomorrow at 10 A.M.
Across town, the Republican convention and corresponding Ron Paul Rally will begin as the sun begins setting. the Branson area needed to capitalize on Political Tourism this year. Today - it's outside of the small private gatherings where political bribes fundraising activities commence - now it's showtime. Missouri Senator Jack Goodman on "The Death Penalty Vs. The Death Option"
Missouri Rep. Dennis Wood explains the "tears of Missouri's Village Amendment"
The Libertarian Pary conjured 6 rounds of voting Saturday before they electing Bob Barr as their Presidential nominee. Ron Paul took several votes that weren't counted due to the fact he wasn't an official nominee. Of course, the antics of the Libertarian Party lend themselves to protest. The final vote at the Libertarian Convention included 30 cast for "None of the above". Paul himself dubbed the Republican Leadership over the last decade as the rise of the "Neo Cons" . Votes not counting, has overshadowed Paul's relationship with the Republican party as he's criticized and legally challenged vote counting methodologies in several states starting with the first Iowa Presidential Straw Poll. On Friday, Paul will speak in Branson, MO host of the Missouri Republican Convention billed as a Ron Paul Freedom Rally. Branson's city Engineer David Miller explains the Tanstone Development and 1.9 million dollar Roark Expansion. The Tanstone project which involved the leveling of land mid 76 aks "the Branson strip" has been the topic of several lively discussions at Branson City Hall over the last few year. Branson City Counsel gave approval to the project Monday May 26, 2008 with a firm warning that right of way issues need to be resolved before second and final reading a week from next Monday. Branson Landing launched the Free Summer Concert series this weekend. As a special treat, Dan Lennon helped arrange for the fire and water show display to continue on the hour while Big Smith jammed. Just a few differences this year. Vonda Sheets was present, but without a six pack of cheap beer and with a new paper that launched today. Mayor Raeanne Presley was not present this year, nor irate as she was last year by the fact the Branson Landing allowed people to bring their own beer. At the opening two years ago, Rick Huffman took the first sip of beer while handing out with Ms. Missouri. But the Branson Edge planted "Butinhouser" to mark the first recorded tall can beer ever consumed on Branson Landing property. This is a historic weekend for Branson. Patriotism is celebrated - as always - but with a special treat this year as Women Veterans are being honored. Last time the event was held. I embedded myself with the first female US Military General. The stories that come out of this event are inspiring. For the Branson Landing, we experimented with Video with a multi-function digital device that can simultaneously shoot film while taking snapshots. Check it out by pushing play above. The second photo shot is posted below. Big Smith started the weekend festivities playing to a capacity crowd at the Branson Landing. Mountain County in Historic Downtown Branson near the Lake Taneycomo waterfront starting on Saturday, May 24. The market will be conducted between the hours of 7:30 a.m. and 12:00 a.m. Saturday until up through Saturday, Oct. 4 except for Saturday, May 17 and will be conveniently located the parking lot at the corner of Pacific Street and Business Highway 65 in historic downtown Branson. It is sponsored by the Historic Downtown Branson Business Owners Association (HDBB), an association of businesses in historic downtown Branson made up of business owners and operators. The Farmers Market will feature fresh produce and locally produced crafts. Cindy Brooks of Clocker’s Restaurant and David King of Branson Bill’s Emporium, both located in historic downtown Branson, are the coordinators for HDBB on the market. King said that they are excited by the event and that it will be held for 24 consecutive Saturdays except for Saturday, May 17. Plumb Nellie Days will be held in downtown Branson on that date. He pointed out that they will strive to have a mix of vegetables and other farm grown products with about a 20 percent mix of crafts. King indicated that the crafters for the event would be very carefully selected and, for the most part, would be those performing or demonstrating their craft on site and said that anyone interested in selling at the market or needing additional information may contact at Cindy Brooks at 417-335-2328 or him at 417-335-5281. The end of this video is great. Sam Clanton discusses the philosophy of the expression "HEY" as a musical accompaniment. "Shakespeare was the Bob Dylan of his day"
The video clip above was shot at the Euro Cafe. 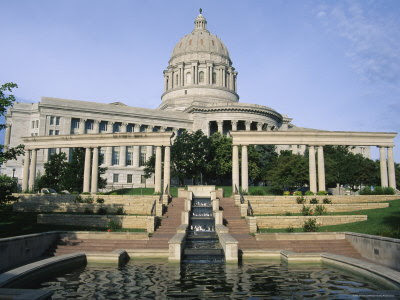 Branson Missouri will be Missouri's Capitol for a day Thurday, May 22nd. Governor Matt Blunt will hold a press conference and meet with citizens from 1:00 to 2:30 at Branson City Hall. From 1:30 to 2:30 Missouri Department Directors will be available for citizen inquiry. Governor Matt Blunt delivered this address on YouTube shortly after the legislative session ended. Missouri Democrats took advantage of the media coverage during the last days of the session issuing a straight F Report Card dispatch the moment the Missouri Legislative session ended Friday. 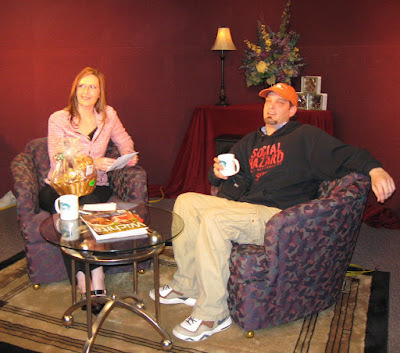 The photo above was shot during and interview with Branson Missouri's Chief Typist and Jennifer McCullough. Prior to the interview I asked McCullough to come hard - which she did. I had to laugh when mentioned at times I wasn't very popular. Of course, popularity as McCullough is referencing has little to do with web traffic but rather feathers of city leaders ruffled by posts. I had to laugh thinking...."Yeah, facists hate me!" I responded with a belly laugh, the kind you can't fake. McCullough runs one of the top marketing and public relations firm in Branson boasting some of the areas most prestigious accounts. She did a great job during the interview and I'm excited to see the end result. During the interview McCullough asks me about wearing hats, which I often wear to avoid the "brush". The hat I'm wearing is special as it related to a story I've been following for the last year. The quality of the hat and wholesale cost is 700% above the wholesale price merchants in Downtown Branson pay for clothing. An international time-share/vacation company setup shop in Downtown Branson with an interesting and innovative strategy that eventually fell flat. Instead of, as one merchant describes, "verbally molesting tourists" the travel company setup a high-end retail store next to the discount merchandise and trinkets synonymous with the Historic Downtown Branson District. The idea was the high-end merchandise would attract the demographic most likely to but a time-share. Last week, the store closed for the traditional ticket=sale strategy of engaging visitors to tour their resort. Downtown Merchants bought the store out quickly during the stores, Blue Tango, liquidation process. Wednesday, May 21 @8:20pm and possibly May 22 same time. Downtown Branson's Plumb Nellie Days attracted hundreds of tourists to Branson's Historic District this weekend. In a sense, the festival is a celebration of the Hillbilly arts - homespun - handmade entertainment arts and crafts. Missouri's 2008 legislative session moved from months of stalemate to movement in the final hours. Local Missouri Rep. Dennis broke down in tears as he described the final hours of the Missouri House to a local television station. "It was awful, 6 people holding up the democratic process but in the end the people won" creaked wood referring to the infamous village law which was pushed into action during the special economic development session last year. The AP summed up Missouri's legislative session and the final hours yesterday. The article is posted on Branson Agent. Branson Alderman met in a special closed session this morning to interview the final two candidates for Bransoon's open city administrator position. Yeserday the candidates were given a reception so citizens could give input and have a first hand encounter with finalists. A long and brutal battle over the village law ensued tonight. The last day of the session begins in 4 hours. Governor Matt Blunt has promised to bring the legislature back for a special session for the second year in a row. Branson Business owners and residents ranked "keeping crime low" as their top priority. The Missouri Legislature voted to repeal the controversial village law today allowed groups of citizens to revolt from counties whose laws they don't agree with. The village amendment was made during a special session of the Missouri Legislature last year and raised a red flag when developer Robert Plaster attempted to create the Village of Table Rock on the day the amendment went into affect. As detailed through the link above the special session of the Missouri legislature was promoted in response to the collapse of the Minnesota bridge. Within the piece of legislation religous/non-profit organizations were passed the gauntlet regarding social reform being allocated privileges previously reserved for competitive businesses. Churches can now bid for contracts with the state. 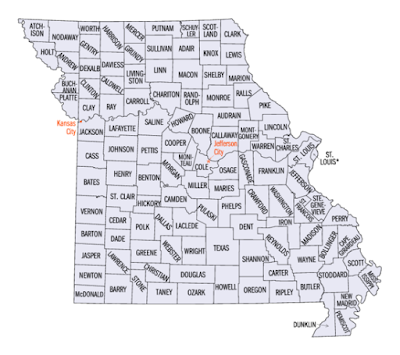 Branson area elected legislatures took the Missouri Political Stage with Dennis Wood being absent from the floor at the request of Republican leadership. Wood accused Missouri House Speaker Rod Jetton of sliding the amendment into the economic stimulus bill last year. Missouri Senator Jack Goodman took the stage in the Missouri Senate filibustering until the House passed the repeal of the village law as the Missouri Legislature rushes to complete the end of this year's session. Several actions were made to keep the bill pork free as legislatures packed the two page proposal to a couple hundred. In commitee the bill was divided into separate parts to avoid killing the intent of Goodman's bill before it ever hit the floor. 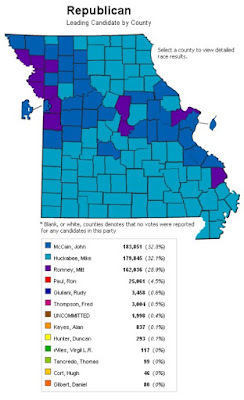 Plaster;s friend, Jetton, played the last man standing as one of six Missouri Reps to fight village law repeal. 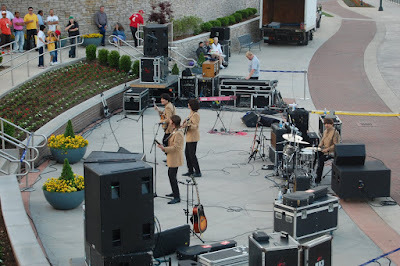 The Liverpool Legends lit up the Branson Landing on their day off of performing on the Branson strip to assist with a charitable effort to support the Missouri Recycling Association and Arkansas Recycling Coalition event. People often associate Branson with conservative politics, but Branson brand conservatism always includes hard stances on environmentalism - the reason people come to Branson year after year - the pristine beauty of the natural environment. Branson offers an extensive recycling program which includes oil and computer equipment recycling along with the traditional bins for paper, aluminum and plastic. Ozark Mountain Newspaper won major props in the citizen survey championed by Branson Alderman Bob McDowell and conducted by ETC Institute. 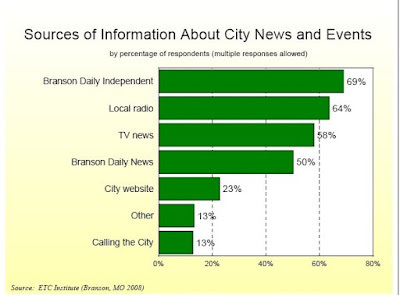 The chart above illustrates the response from citizens when asked how they get news about the City of Branson. A whopping 69% said they receive news from the Branson Daily Independent (going to move that chapter in journalism adventures up the resume). On the other hand, the Branson Daily News took a major blow ranked fourth after television which was ranked third. Analytics suggests the Branson Edge reaches 1 of 7 residents though the question wasn't posed in the citizen survey. It will be interesting to see how this changes over the next few years. 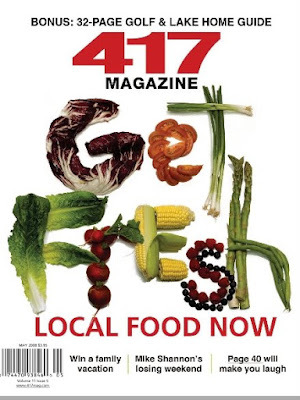 417 Magazine released a high-resolution digital version of the Southwest Missouri lifestyle magazine this morning. Subscribers will have the ability to view the digital version with their subscription. Branson's Citizen Survey results were presented by a representative of ETC Institute last night at city hall. Lots of Interesting Observations and discussions will result from the citizen survey presented at last nights Branson alderman meeting. Apparently, Springfield, Mo is using the same firm, ETC Institute, to conduct their citizen survey. Evangelist John Hagee reported 18,000 was raised to support charitable action in Israel last week in Branson. His sermon betwixt politics and religion preaching our government should view an attack on Israel as an attack on attack on the United States. Hagee also asserted that if Iran were to attack Israel that the aggression would likely be of the nuclear variety. 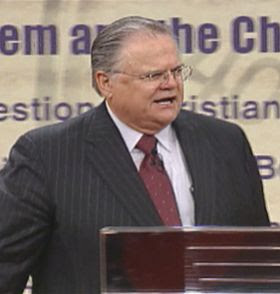 The primary focus of Hagee's fund raising efforts was to help combat poverty in Israel. Recipients of U.S. Government-issued economic stimulus tax rebate checks or direct deposit distributions are eligible to receive a voucher for two free tickets to a Branson show. To qualify, recipients must bring a copy of their U.S. Government-issued check or proof of direct deposit to the Branson/ Lakes Area Chamber of Commerce and Convention & Visitors Bureau, located at the southwest corner of the junction of MO State Hwy. 248 (Shepherd of the Hills Expy.) and US 65 in Branson, MO 65616. Tickets will be distributed in a random format. Upon presenting a copy of the check or proof of direct deposit, the recipient will draw an unmarked envelope from the official Chamber ticket distribution box. Inside each unmarked envelope will be a voucher for 2 tickets from a Branson show. Recipients will then go to the show's box office to exchange the ticket voucher for actual show tickets. No other exchange of ticket vouchers is permitted. OFFER ENDS JULY 4th, 2008. 14. The Happy Trails Theater featuring Roy Rogers, Jr. The carefully laundered factoids strewn together into a collective body of published opinion that graces the front page of Ozark Mountain Newspapers tri-weekly tabloid are only sometimes marked "opinion". The adjective before this series, "Old" is a good description for the ethically challenged reporting the community has been accustomed to over the last few years. What we can pin is the next victim of the "Old" columnist will be. Ironically, he's the last vestige of the "Old" watch and appears to remain the victim of the hatred which has defined the last year of "Old" style reporting. Hate speech 2 hard facts O. On the homepage of the Branson Edge a firsthand non-editorialized examination of the hard numbers is posted. Retrieving updated numbers has been difficult since the city no longer has a full-time financial director. If Branson's economy is stagnant where is the failure? The theatre industry currently is the most subsidized industry in Branson reaping 10 times a return on their tax dollars. The money is funneled to a highly experienced local marketing agency, who often functions as a private club - without any real accountability. The "old" reporter states Branson's numbers remain static while HCW properties continue to deliver an increasing return on investment. The infrastructure in the two areas are financed by (Tax Increment Financing) TIF dollars - like Silver Dollar City's TIF financed development. Of course, our neighbors to the north (Christian County) and to the Northeast (Joplin Area)and to the south of Branson (Hollister) all have massive TIF projects being negotiated. Both counties have higher anticipated growth rates than the Branson area. Back to our massively subsidized fiscally static theater industry - If we're dumping $15 million dollars in taxes to boost an industry that isn't growing - whose responsibility is it? Either the Theater industry is declining and being artificially boosted through massive marketing efforts just to tread water or the Branson Chamber of Commerce and Convention Visitors Bureau is a dismal failure promising to propel the Taney County Economy into bankruptcy. We haven't reason to believe that the Branson Chamber of Commerce / Branson Convention and Visitors Bureau is failing us but the newspaper certainly is. They're failing us by conveniently ommiting details ( a violation of ethics) and failing to scrutinize the parties and economic attributes that create the business environment we all depend on to put food on our family's table. If they ignore it, continue to act as "government lapdogs" instead of "government watchdogs" eventually they'll be drowned out in the way so many Branson area newspapers have - with relevant detailed coverage of our community by emerging publications. In a year and a half, three members of Branson's City Government have been the focus of vile, biased and prejudiced attacks - while others are worshiped. The "Old" method of reporting has become predictable. Here's a view of an issue "Old" addresses regarding one of his sacred cows - Alderman Stephen Marshall. Stephen Marshall is arguably the most intelligent, politically aware individual sitting on Branson's Board of Alderman to date. Marshall's full time job is to maintain and compete for convention business in one of Branson's premiere properties. The fact Chateau on the Lake is competing for convention business is undeniable. Marshall's experience in the convention business puts him in a strong position to advise and interpret data relating to Branson's Covention Center - contrary to the statements expressed through faux-reporting (partial reports) and editorials the potential of a conflict of interest isn't so far fetched. The conflict of interest isn't in the overall numbers or basic strategy - the question of conflict remains in the fact Marshall has access to the complete client list. We're lucky to be blessed with John Q Hammon's vision for Table Rock Lake and we're lucky to have a man as brilliant as Stephen Marshall sitting on Branson's Board of Alderman though contrary to a year of "Old" reporting, Marshall doesn't walk on water and if the reporter gave half the scrutiny to Marshall that other politicians are given - the community might know it. I don't want to conclude whether Marshall's position in oversight for a competing entity is a conflict, but to deny the legitimacy of such a question is ludicrous. No public official should be above scrutiny and failing to explore legitimate questions breeds the types of problems the press should be helping us avoid. After three closed session meetings last week the City of Branson announced they've narrowed down the candidates for Branson's open city administrator position. Branson's board of Alderman passed a number of amendments collectively dubbed "Dody's Laws" which vastly expanded the board of alderman's range of power in addition to a more open process by which citizens can question Branson's city department heads. Branson Mayor Raeanne Presley has announced the two finalists for the position of city administrator. They are Dan Galloway, city manager in Stillwater, Oklahoma and Dean Kruithof, deputy city manager in Fort Smith, Arkansas. Within the next two weeks, Presley said the Board of Aldermen will hold a public reception, which will be attended by Galloway and Kruithof, to give citizens and community leaders a chance to meet and visit with the city administrator candidates in a social setting. Shortly after the reception, the mayor and aldermen will meet to select the new city administrator who could be in his Branson City Hall office in early summer. Both Galloway and Kruithof were among several candidates interviewed by the Mayor and Board of Aldermen last week. Galloway has 30 years of experience in public administration. Prior to becoming a city manager, he served as a program director for a joint federal-state planning agency for the Upper Mississippi and Missouri River system where he directed a major plan for the U.S. Congress to balance upgraded locks and dams on the Mississippi for barge traffic with environmental and rail industry concerns. Since 1984, Galloway has served as city manager for suburban communities in both the Tulsa and Oklahoma City metro areas. In an economic development role for Stillwater, which has a population of 50,000 and is home to Oklahoma State University, Galloway serves as vice chairman of the Oklahoma Technology and Research Park in Stillwater. Galloway has a Bachelors Degree from Western Illinois University and a Masters Degree in Urban Planning from Southern Illinois University. He and his wife Diane have five adult children and 13 grandchildren. Kruithof has over 27 years of broad municipal management experience and has worked in administrative positions in Wichita, Kansas; Stillwater, Oklahoma; Pittsburg, Kansas and DeKalb, Illinois. He has been the Fort Smith deputy city administrator since 1999 during a period of strong community growth and development. During his tenure in Fort Smith, Kruithof has had extensive experience in capital improvement projects including the development of a convention center, numerous street improvements and the expansion of the regional water supply. He spearheaded the city’s first comprehensive development plan and is involved with regional economic development efforts and affordable housing alternatives. Kruithof has a Bachelors Degree in Political Science and Masters Degree in Public Administration from Oklahoma State University. Kruithof was born in Carthage, Missouri, and raised in Miami, Oklahoma. He and his wife Cynthia have one son who recently graduated from college. An initiative to eliminate Missouri's Gambling Loss Limit regulations will hit the November ballots. Proponents of the "School's first Initiative" say a change to the constitution will help Missouri compete with neighboring states currently vying for the regional gambling dollar. As part of the proposition, no new casino licenses will be issued.